WTF is he is talking about? If you subscribe to man-made global warming the way Jerry Brown does, you think it’s bad to have billions of people using more energy and emitting more CO2, so it’s better to have fewer people using less energy and emitting less CO2. But if you subscribe to man-made global warming the way Jerry Brown does, then why do Jerry and Democrats offer a welcome mat and a Swag Bag full of goodies to illegal aliens and Middle Eastern refugees? This only makes it harder to meet the strict lower carbon emission goals of California’s Global Warming Solutions Act of 2006, also known as AB 32. The pro-amnesty Jerry Brown has a long history of inviting illegal aliens into the Golden State through the scores of bills he has signed into law providing illegal aliens everything they could possibly need, including being able to vote. It is interesting to note nearly all of the bills benefitting illegal aliens have been authored by Los Angeles Sen. Ricardo Lara, who was an anchor baby to illegal alien parents. Free education… financial aid… student loans… low-cost auto insurance… free health care… free child care… free legal aid… subsidized housing… food stamps… school breakfasts, lunches, snacks and dinners… drivers licenses… the right to vote… California’s millions of illegal aliens are even enjoying many benefits the state’s legal residents and taxpayers do not, but are paying for. And it comes at a very heavy financial burden — legal residents are not just paying for their own health care, rent, transportation, food and education, they are paying for illegal aliens’ as well. Brown formalized California as a sanctuary state by signing the Trust Act into law, limiting California’s cooperation with federal immigration authorities, to prevent deportations from the state. When Brown signed the law giving driver’s licenses to illegal aliens, his real motivation was to have them automatically registered to vote via the DMV. In June, Brown signed SB 4 authorizing free health care for illegal aliens – of course authored by Sen. Ricardo Lara. Through the bill, California became the first state to request an “innovation waiver” – a loophole in the Affordable Care Act—to expand coverage to illegal aliens as along as the state (taxpayers) pay the extra costs under Covered CA, the state Obamacare exchange. This is expected to cost California taxpayers at least an additional $2 billion annually. You may remember AB 32—in 2006, then-Governor Arnold Schwarzenegger signed this dubious climate-change legislation called California’s Global Warming Solutions Act. AB 32 required the California Air Resources Board to develop new regulations and create “market mechanisms” to reduce California’s greenhouse gas emissions to 1990 levels, by 2020. But government cannot create “market mechanisms” – only the private sector really can, because market mechanisms are supply and demand. When government gets involved, it manipulates naturally created demand. AB 32 was supposed to be based on real climate science that proved that unless dangerous greenhouse gas emissions levels were reduced, the earth’s atmosphere would diminish and we’d all die. But at the crux of the issue is altered data and science. The data originally produced by the Intergovernmental Panel on Climate Change scientists in the 1990s were altered by government bureaucrats in order to create a crisis, as well as a demand. Ironically, California already achieved the lower emissions goals largely through advanced automobile technology. But no government program or agency goes away. So now a new bill, SB 32, calls for even further reductions bumped now to 40 percent below 1990 levels, by 2030. They keep moving the goal posts. Both AB 32 and SB 32 essentially authorize the California Air Resources Board unlimited power to regulate and even tax businesses without Legislative oversight. The same bill had been attempted and killed last session, because a group of “moderate Democrats” from economically depressed districts opposed it. This year, after receiving phone calls from the White House putting pressure on them to tow the Party line on climate change, these “moderates” voted for and passed SB 32. And Gov. Brown signed it, along with the companion bill, AB 197. The actual goal for the California Air Resources Board is to redistribute money from wealthier legislative districts to poorer legislative districts via the cap-and-trade taxing scheme. Naturally, those lawmakers from the poorer legislative districts were convinced to vote for SB 32 with the promise that more money would flow into their district, and for which they can take the credit. The “cap” in cap-and-trade is the legal limit on the quantity of greenhouse gases a business can emit each year, and “trade” means that companies can swap or trade emission permits among each other. Prior to California developing a cap-and-trade program, one of the most important environmental programs tied to theUnited Nations Agenda 21, was the U.S. cap-and-trade legislation. But when the cap-and-trade legislation failed to pass in the U.S. Senate, the Environmental Protection Agency instead took it upon itself to regulate greenhouse gases, ignoring Congress. The CARB’s quarterly emission auctions have been dismal failures. The May auction only brought in $10 million, with the Air Resources Board anticipating hundreds of millions in “revenues.” The August auction garnered a little bit more, but was in no way successful. For that we should be thankful. However, none of this failure has deterred Jerry Brown, who had counted on using the cap and trade revenue to fund his High Speed Train to Nowhere. Without it, he instead doubled down on Climate Change woo-woo taxing schemes, rather than choosing to act like the adult in charge of one of the largest economies in the world. 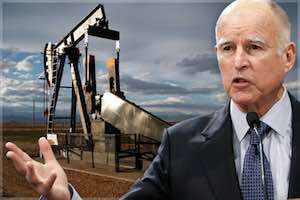 Apparently the 9,000 California companies which moved their headquarters or diverted projects to out-of-state locations in the last seven years because of California’s “hostile business environment” is not the environment Jerry Brown is interested in. Slapping businesses, property owners and taxpayers with additional costs and regulations imposed by CARB bureaucrats and illegal aliens’ healthcare costs is. Hypocrisy, thy name is Jerry Brown.